Thailand's Sumalee Nawakul puts together a palette of vibrant colors for the design of this necklace. She uses rice-shaped beads carved of littleleaf boxwood, creating 10 hand-knotted strands that twist into a necklace. You can find wood torsade necklace 'Songkran Belle' by Sumalee Nawakul in jewelry categories such as Eco-Friendly Necklaces, No Stone Necklaces, Polyester Necklaces, Wood Necklaces, Beaded Necklaces and Torsade Necklaces. Enjoy exploring these sections for other Novica treasures. I get comments and compliments every time I wear it! This necklace was even better than I expected. 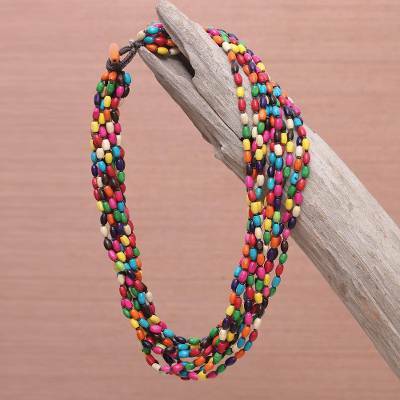 The wood beads make it light weight, and the colors will go with anything in your wardrobe! My day was truly made when I opened the package, saw the beautiful colors and tried it on. Perfect for a dull grey winter day! The necklace is a bright pop of color for certain. Also, it is nicely very light on the neck since it is made with wooden beads. Look forward to wearing it in summer. This was more than I expected. Lightweight and easy to wear. Colors are stunning and will brighten up anything I wear. Received wood torsade necklace, "Songkran Belle". It is very colorful and will look great in Spring & Summer. I love it! Great piece to wear with something that just needs a statement piece. . This piece makes you take another look. Well made, vibrant colors. Wear it with casual to dressy outfits. "Great gift for friends and family"
It is lightweight and the colors go with everything. Whenever I wear this, I receive compliments from strangers. I love its lightness - you hardly know you have it on - and the colours, which lift any outfit.